First, the miners seized a train in Burke, Idaho. It was April 29, 1899, and for a decade miners in the Coeur d'Alene mining district had battled to unionize all of its mines so workers could get better pay. But the Bunker Hill Mining Company at Wardner, Idaho, resisted. Its superintendent, Albert Burch, had recently fired 17 workers and refused to recognize the Western Federation of Miners union. So the union members, fearing the precedent Burch might be setting, took action. They took the train in Burke at gunpoint. More men climbed aboard at the next stop, and more again at the next. They kept going, loading on 80 wooden boxes, each containing 50 pounds of dynamite. They picked up 200 more miners in Wallace. By the time they got to the site of the Bunker Hill mine and mill, they had a thousand men, many wearing masks and carrying guns. Workers of the Bunker Hill mine fled, though at least one was shot to death by the union members. The union members lit the dynamite. 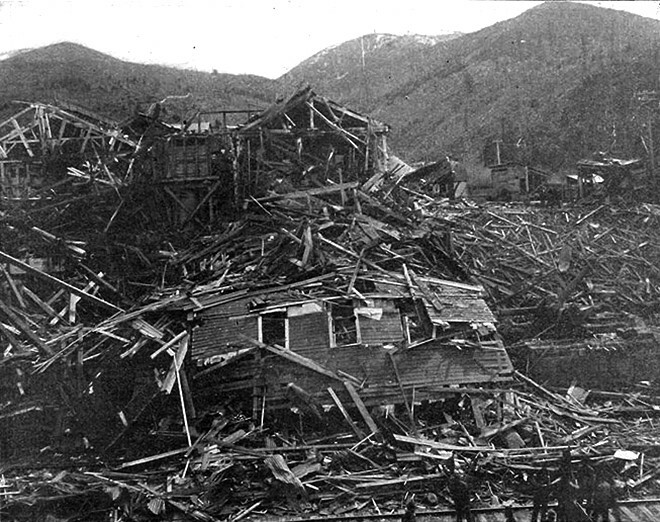 The entire Bunker Hill mine and mill exploded. The union members boarded the train, now dubbed the "Dynamite Express," and went back home. It was not something authorities took lightly. The U.S. Army was called in, and "mass arrests" started on May 4. In the end, 1,000 people were indiscriminately arrested and thrown into a makeshift prison called the "bullpen," according to excerpts from a book written in 1998 by journalist and author J. Anthony Lukas. The state auditor, Bartlett Sinclair, developed a permit system, endorsed by the U.S. Army, that prevented mines from hiring union members. The original print version of this article was headlined "1899 LAST STOP FOR THE DYNAMITE EXPRESS!"